Even if you're only staying in Mombasa for easy access to the beaches, a Mombasa tour should be part of your trip to this second-largest city in Kenya. Mombasa isn't a city packed with tourist attractions, and it's not as large or modern as the capital Nairobi is. But contrary to Nairobi, which was founded by the British after 1902, Mombasa is one of the oldest cities of East Africa and has lots of history and culture to offer. Most of the sights in a Mombasa tour are the historical kind which can be a very nice change of pace from the touristy beaches and resorts of the coast. Many people love it, some hate it, but Mombasa has a special feel to it - a result of the many ages of invasions by foreign peoples which brought diverse religious and cultural influences to the region, including Islam. 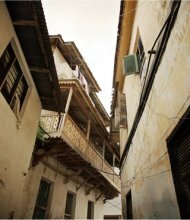 The neighborhood known as Old Town should be the first stop on your Mombasa tour. You can find this part of the city towards the eastern side of the island, near Kilindini harbor and Fort Jesus. 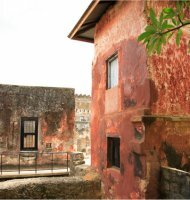 This area is a look through history at the various people who have lived in Mombasa through its complicated life. There is architecture showing off African, Asian, Arabic and European styles. It's a very interesting place to visit, even though its mainly a residential neighborhood these days. Some of the buildings are run-down, which may or may not appeal to your sense of history. Either way, it's a real living neighborhood, not a museum display. If you're visiting Old Town, you just have to make a stop at Fort Jesus. It's the best known attraction in Mombasa. Tour the centuries old fort, originally built by the Portuguese in 1593. There is a museum on the site, but many of the fort's rooms and buildings are still intact as they were in the past. Fort Jesus sits on a coral reef at the mouth of Kilindini harbor. For the shopping tourist, the market street of Makupa should be marked off on your map as your first stop. It's bright, fun, loud and a not-to-be-missed shopping experience. You can find Makupa in the center of the city, off Mwembe Tayari Road. There are vendors of all kinds in this open-air market. Biashara Street is the place to visit if you are in the market for some colourful African fabrics. One more shopping destination should be the Bombolulu workshops (you'll likely want a cab for this one, as it's just on the edge of town). There you can find hand-made crafts, jewelry, carvings and clothing all made by the physically disabled. Stop in at the Information Bureau on Moi Ave, for leaflets, booklets and maps about the city. You can't miss it, the office is right near the great tusks at the entrance to Mombasa (another sight you might want to see). My favorite place to book holiday tours to Mombasa is Africa Guide. They offer by far the biggest collection of Kenya holiday tours I’ve ever encountered – currently over 150 – and as dedicated Kenya specialists their tours are a lot more interesting than those of the big Western travel organizations.